Please advise if you had a savings goal by 30. For some reason I’ve always had a goal to accumulate 100k by the age of 30. If you have more than 100k saved are you on the right track? I suppose it depends on your goals/ ambitions. Right now I have some student loan debt but have around 135-140k in savings. This includes EF, taxable accounts, and 401k. But I also understand some points that I’m only 30 once and to enjoy a little. I do try to enjoy a nice bottle of wine and go out to nice restaurants every once in a while. Need to enjoy your way to the top... am I right? Last edited by Esq123 on Sun Apr 14, 2019 8:12 pm, edited 5 times in total. Not sure I would have savings before getting rid of debt, depending on interest rates and other details. I think 100K by 30 is solid, I had a bit more at that age but who cares? I am glad to have more than twice as much at 37 as I did at 30. It will speed up like that especially when the markets do well. Keep working hard, saving, and enjoying life. I agree, networth is more meaningful and unless these loans will be forgiven or the interest rate is super low, OP should pay them off. A 5% interest rate paid off is the same as a TAX-EXEMPT risk-free bond paying 5%. In reality even equities may not provide 5% after-tax, and they certainly won't do it risk-free. This really depends on income and goals. I am at ~$115K liquid at 27 and hope to be at $200-250K by 30, but that is heavily dependent on the market (that would assume a mostly flat market). When I was 30 my goal was to pay off my student loan debt. 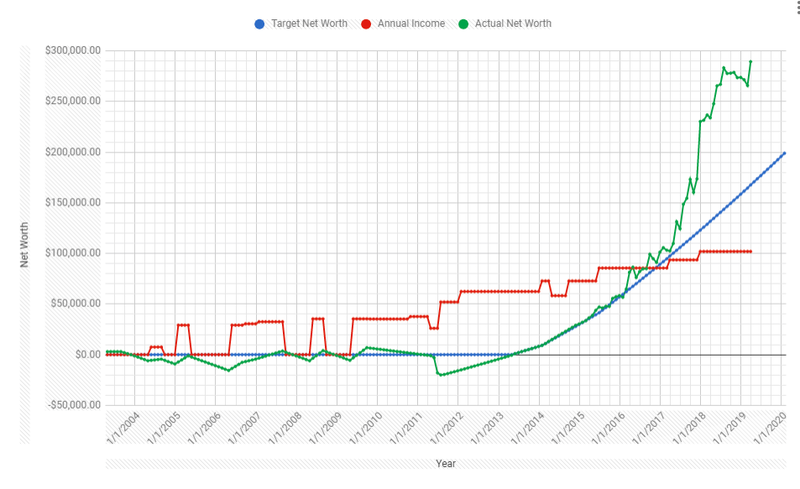 After that it was to hit an investing rate of X% of income, then save Y, then to increase my net worth by Z%. Be careful not to set age-based goals, especially if you frequent these forums. I think that leads to comparisons, envy, and possibly depression when you see that many others are ahead of where you think you should be. Do what works for you. Seems like a fairly high savings at your age when you also have student loan debt. Are you making the loan payoff a priority? I was taught by my parents to save, but I can’t say that I had a specific savings goal in mind. Once I bought my first house, I started to focus on investing. I agree with the previous response that it would be better to have goals for yourself and then think of the steps needed to achieve each goal. For example, maybe you need to create an emergency fund. Maybe you want to pay off your student loan or credit card debt. These are just hypothetical goals. If you have more than 100k saved are you on the right track? Right now I have some student loan debt but have around 130k in savings. This includes EF, taxable accounts, and 401k. 1) Have an EF. Check. 2) Are funding at least 10%, preferably at or on track to put 15% of gross income in a 401K account. 3) Pay your bills on time, do not carry credit card debt. 4) Develop a workable plan based on your income, current needs and your own future goals (downpayment for house, paying off student loans, saving for wedding, saving for a long term goal that is unknown in a taxable account). 5) Don't pay attention to what the Jones's are doing, what your 30 something neighbors are doing. Pay attention to what you are doing and make adjustments as needed to get to your next milestone. 6) Don't buy too much house (house poor) or too much car (financed with debt) to detract you from being able to save for your retirement and paying your bills in a timely fashion. Avoid car leases if you can, they rarely make financial sense. 7) LBYM - Live Beneath Your Means. You didn't accumulate $130K by living at or above your means. So to answer your question, I'd say without knowing more, you are on track......Congratulations! It's not about the dollar amount, it could be for you, or it could be by age 35 I will have X% of student loan debt paid off or by age 40, I want to have 2-3x income saved/invested and so on. You march to your own drum, not the drums banged on websites including some of the figures tossed about on this forum. I was just under 300k in net worth when I turned 30 (late last year). But it really doesn't mean much without context. Well I didn't get an inheritance or buy a house when the market was down I did have the benefit of graduating college with only 4k in loans (most of the cost was covered by my scholarship but my parents also gifted me 4k a year for a total of 16k). I also started my "job" at the age of 22 in a field where year 1 wages are 55% of year 30 wages (ie relatively good starting pay but limited room for growth compared to many careers). So yes I am happy where I am at but at the same time an MD with 0k in net worth at age 30 would still be in a much better monetary state/path than me. That's a lot more than I had. At age 30 I became eligible for a 403(b) plan at my first college-teaching job after graduate school (Ph.D.). At that time I was still single and had no debt, a 10-year-old VW Beetle, and the equivalent of maybe $10K in today's dollars in the bank. I never aimed for a "number" in total savings, or early retirement. I started by contributing 10% of my salary to the 403(b), and increased it in stages until it reached around 40% at age 56, seven years before I retired. I hit $100K in today's dollars when I was 40. Fortunately I married someone who is more frugal than I am, with similar salary and a higher savings rate. She now has more than I do, about 55% of our total savings. It turned out we both retired at age 63, five years apart because of our age difference. She did it voluntarily because she had gotten stressed out, and we agreed that we had enough saved up that she could do it. I did it because I was forced to, but came to embrace it when we saw that we had more than enough savings. Age 28. No debt(paid off huge student loan recently). Net worth around 300K. I had my first (real) job at 30. I traveled as much as I could or had to - so no much savings - and 2 years later we took an education loan for 200k. I am not saying that you should spend carelessly but you have to be careful: those years never come back and are the most beautiful in ones life. "Right track" at 30 is not measured in $ but in how you lived those years and what memories did you create. Graduated in 2011, paid off student loans in 2013, bought house in 2016 (age 30 in 2016). At 30 I had 10k to my name, no retirement plan and a new condo. OP is doing really well. I wanted to buy a house. Bought a duplex foreclosure for $50k, invested $35k in it, rented for years, and sold 9 years later for $275k. I’m not much for making goals, but I’m happy I had that one. I learned a lot, got a decent return, and got out. Curious - how did you make $35k+ a year while in school? 2006-2007 was a 1 year internship. 2009-2011 was grad school, so I had a stipend as an RA/TA and a government research grant. Currently 30 with around $140K. I definitely agree with most others that there is to many factors to have a specific goal. I didn't have student loan debt but most of my 20s was spent making $40K-50K a year and I'm going to top out at probably $70-$85K. Where as say I had the ability to do something like med school I would have little savings and a lot of debt right now. But my future earning would more than make up for that. Your savings goal is going to be based on your income. If you started work at 22 with no loans making $40k/yr and finished at 30 making $80k then you might have a nice chunk of change saved. Same person with $60k in student loans may not. Same person who got to live at home with there parents for 3 or 4 or more years might have more saved. What’s important is that do you have an end goal in mind and are you moving towards it at a reasonable rate. As long as you are putting away a minimum of 15% of your gross wages + any matches you might get, you should be well on your way to a secure retirement. Your savings goals... would be determined by your objectives... if you want to retire at 31 you better have a really really low living expense if you want to stretch your dollars. Which one is "on the right track"??? Having two times your annual salary saved should be the goal of 35-year-olds. Four times your annual salary is the target for people who reach the ripe old age of 40. If you’re 45, try to have at least five times your salary saved. Gen X folks should have at least seven times their annual incomes saved by the time they are 50 years old. That jumps to 11 times their annual salaries at 60. I’m currently 30 and my financial goal was to be debt free and have a $250k net worth. I became debt free at 27 after going through Dave Ramsey’s plan and reached $250k shortly after my birthday in January. I would say you’re far ahead of the typical 30 year old. I also wonder how I’m doing against my peers and found an interesting article from Financial Samurai about age and net worth - pretty easy to find on Google. My next goal is to have $1M by 40 and I wanted to retire early but not so sure anymore - my job has gotten much more fun and the future is bright! Plus my spouse is on a very nice career path so I don’t want to retire early without her. Like others have stated, you’re doing a fantastic job and I would look into getting that student loan paid off. From one 30 year old to another, the feeling of owing money to no one is absolutely incredible. As Dave Ramsey says, if you don’t like being debt free you can always go and get a loan. Achieved 1st three well before 30. Checked the last one off the list couple months prior to 30th bday. Seems like you're doing well for yourself - to give some perspective I recently turned 29 and have ~50k across my accounts. Not too much. It’s fine if you decide spending money on $100 bottles of wine or $200 meals is your idea of entertainment but that easily becomes the norm. Be careful what you decide is your enjoyment otherwise you may find yourself spending way more than you should be. I’d rather spend big bucks on something that is a special occasion or a special purchase rather than something that is recurring. Case in point, we just purchased a used piano for ~$6000. We haven’t been inside a restaurant where we’ve picked up a tab since New Years. A piano is not a recurring expense (save the yearly tuning). I suspect people who “enjoy” themselves at restaurants are spending $6000+ a year just on eating out. Don't focus on savings (except for emergency purposes). Focus on net worth instead. Having 100K in savings and 0K in student loans is different from having 100K in savings and 100K uin student loans. I think we have most every advantage to us on our journey to 30. We've averaged 40-50% savings rate through our 20s. Focused on minimizing maintenance items, increasing comp and I am/was deep into credit card churning. I think we had our 20's cake and ate it too. @ 30 - $550k equities & $150k home equity. We're now at 31 with a 4 mo. old. Goal is FI by 40 and FIRE by 45. I think you're doing great and keep on chugging along. You're near the snowball point where things really take off! At 30, I technically had student loans left but at absurdly low interest rates. I had maxed out my 401(k) the prior year, plus had been on track to do so for that year (I changed jobs, happily taking a layoff two weeks before my 30th birthday). I also had put money into IRAs for a few years, and had some money in taxable thanks to a signing bonus the year prior. I hadn't yet bought my first Series I Bonds (should have, did not). I think my total networth was in the low six figures, not bad for someone who didn't finish graduate school (Ph.D.) until shortly after his 28th birthday. I turned 29 in March. I wrote myself a check for 600K as motivation when I first got out of undergrad and in the memo put "30th birthday present". Such a random number but I just wanted to put it out there. When I wrote the check I felt dumb but that I needed to have a goal by 30. We currently sit at 550K and should break 600K unless everything hits the brakes by 30. This has taught me that you have to put it out into the world to get it back. Our short term goal is to find a 4 plex as a rental by 30 too! At age 30 I had a negative net worth of $30,000. I had a singular goal of finishing paying off my student loans. I was earning a little over $100,000 a year. Net worth today, 24 years later, is more than $16 million. Financially what mattered to me then and now is my savings rate percentage. I always have saved more than 50% of my after-tax income. 16 million?? Lol nice...hope you’re retired. Yes, I think you are doing great! Wealth accumulation is a process that takes time. At your age I had significant student loan debt and a career headed to the stratosphere. I paid off those student loans, while I enjoyed my family, life and work. Today I am a multi-millionaire and I am free to do what I want in life. Good luck. Nope. Two kids headed to college in the next few years, a great life and lifestyle and a solid business. Once we have launched the kids I will make changes. I admit it will be hard to walk away from the money even though we have more than enough. This forum is a great source of wisdom, sound advice, and best practices. On the flip side it’s full of critics as we are all running our own race and want to think we know best. Additionally, your personal finances are a function of your life situation and all the decisions you have made. “Comparison is the thief of joy” - Theodore Roosevelt. As a competitive and driven person I don’t read this quote and think I’ll give up and stop comparing myself, but more remind myself this is a journey and we are all at different places. More importantly, by applying the core teachings of this forum and the suggested readings you can improve your finances regardless of where they stand today. If I look back at my first post on this forum to where I am today my net worth has risen substantially and that I am proud of. I just tried to max out roth and 401k in my 20s, everything else seemed to go towards mortgage / travel. I finally got the mortgage paid off at 33. I don't have my 30 year old net worth, but can extrapolate back from 33. My income at 30 was ~100k and is now ~140k. Megacorp engineering individual contributor role. But my wife also has similar NW, so total family net worth is roughly double those numbers. While it is a nice chunk of money and likely better than most 30 year olds, I don't think an absolute number (like $100k) means much without knowing what it is for and how you have gotten there. This amount could mean very different things if you plan to use it all for a house down payment in a year versus this being "untouchable" retirement money. Depending on how long someone has been making $200k it may or may not indicate a good savings rate. The aggressiveness of your student loan payoff rate is also a factor in evaluating this number. I told our kids when they came out of college and took jobs with no pension plans, that they should be putting about 15% of their income into retirement savings. Savings for other things like house down payment, cars, etc., need to be on top of that. You will need about 25x your expenses at retirement time to fund your expenses. A 2% inflation rate means that the cost of living will double in 36 years so $100k in current expenses will inflate to $200k by age 66. This means you will need about $5 million to replace $100k in current expenses if you retire at 66. These are very rough numbers and exclude other income sources like Social Security but they give you a starting point to think about the magnitude of what you need to save. It's interesting to read some of these replies! I'm a couple years younger than you, and have thought of this recently. My savings rate is around 35% of gross pay. Homeownership so far has been a stream of expenses and repairs, and I have plans to improve aspects of my home. I want to budget in some traveling expenses in the coming years as well. Trying to find a balance of work, play, and personal goals. I did not have an explicit savings goal, but I always lived below my means and was consciously trying to save rather than spend. For example, the year I turned 30, my housing cost was $2850/mo on 800k of income in a VHCOL area. That got my wife and I a 1 bedroom apartment. We could have spent more and gotten more but there was no need. With that philosophy toward saving, I’d saved 1.2M by age 30. No. Never had such goals, unless you count "try to save more" as a goal. That depends on your life goals and plans. If you intend to retire at 31, you may not be on the right track. But if you plan to work until more standard retirement age, then you are likely doing better than most. That's nice. But obviously it depends on how much "some student loan debt" is. If you have 130k in loans and 130k in savings, that may not be great. "Keep on saving" is the best thing you can do. Enjoying each day while living beneath your means will serve you well. We had a similar approach and it has worked out well. We Purchase whatever we needed, however, as it turns out, we didn't feel the need for going bigger. Whew, a look back in time. I think at 30, I had about $30k to my name. Not shabby, and I was proud to have no debt. But not exactly on the fast track either. I had no target, and I am glad I did not. I lived a relatively frugal life, yet had fun where it was important to me to do so. Everyone's beginning stages will look much different, and by no means is where you are at 30 a predetermination of where you will end up. Either direction.